It's an especially cruel irony that the shower is one of the filthiest places in your bathroom. While you may be tempted to ignore the problem until your lease is up or your family’s in town, doing so actually means that you're washing yourself with mold. Oh, I'll explain that one -- and many more gross-out items. To find out more about all the terrifying things lurking in your shower, read on. Let's start with the more obvious things that are making your bathing space totally disgusting, like that nasty shower curtain that's covered in moldy spots. Even the ones that bill themselves as "mold-free" will eventually develop a fungal growth that will turn plastic shower curtains into something resembling Gorgonzola. Keeping the shower curtain closed will help -- when the material folds back on itself, water will become trapped, making a welcoming home for mold and mildew. Clean it up: Leave the curtain dangling on its rod, treat problem areas with a bleach-based spray cleaner, and use a sponge to scrub away mold and mildew; wash it in the machine using cold water, a small amount of detergent, and ½ cup of either bleach or white vinegar; or (let's level here) buy a new one. "Shows what you know, lady! I don't use a shower curtain -- I have glass shower doors." Okay Mister, now it's your turn! 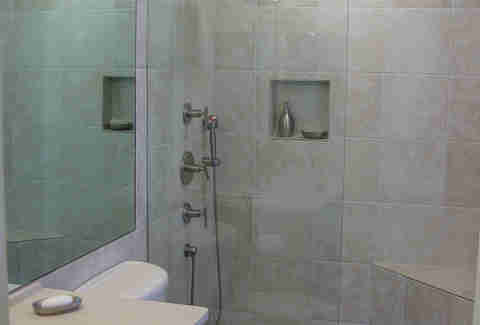 Glass shower doors are notorious for developing a patina of soap scum that creates a milky, cloudy appearance. In time, that soap scum will breed Serratia marcescens, which is a science-y term for that pinkish-orangeish bacteria so commonly found in bathrooms. Also, it's just ugly! To prevent soap scum and water spots from building up on glass shower doors, use a squeegee to wick away water and product run-off after showering. Clean it up: This is weird but true: dryer sheets like Bounce can be used to scrub soap scum away. Wet the sheet and ball it up to use it just like you would a round net scrubber. 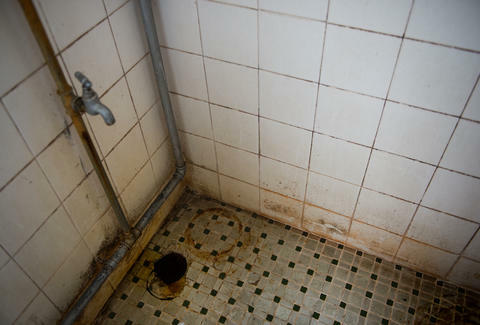 Just as with the shower curtain, your shower walls are probably streaked with soap scum which, over time, will lead to the development of mold, mildew, and bacteria. 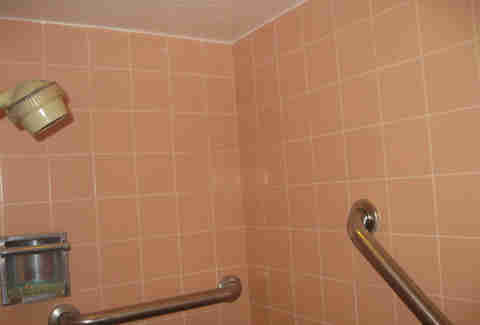 This is especially true of tiled showers, where porous grout likes to hang on to funky-looking spores. Clean it up: A heavy-duty mold and mildew eliminator like X-14 will make short work of removing unsightly growth without requiring scrubbing on your part. Go take a good look at your tub or the floor of your shower. What do you see there? A brown ring around the tub? Black marks where your dirty feet have stood? Hairs galore? The tub itself will get really grimy over time, which is annoying since it's the place you go to get clean! Does water back up because of a slow-moving drain? Fix that. Backed-up water will leave behind product buildup that will make a mess of your tub. Clean it up: Fill the tub with very hot water, add a large scoop of oxygenated bleach like Oxo Brite, and let it sit for 30 minutes. 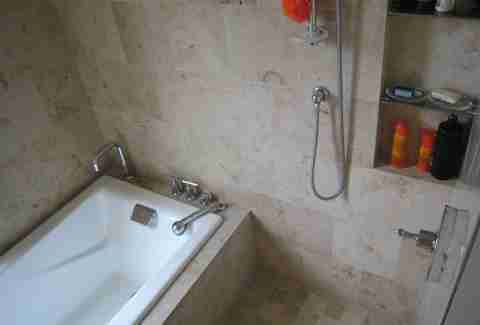 Drain the tub and use a sponge to quickly scrub away any residual buildup. 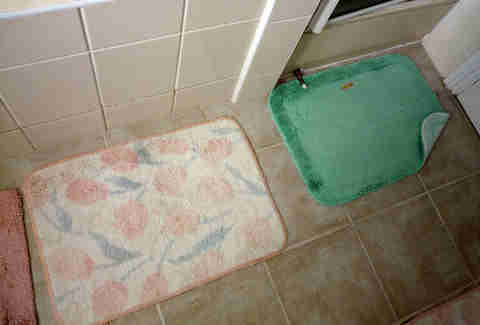 Rubber tub mats can help to prevent slipping in the shower, but they come at a cost. When was the last time you looked underneath that thing? Go ahead, I can wait. Gross, right? Covered in mold and slightly slimy? Yuck, eew, nasty, gross gross gross! Clean it up: Just like with grout, use a mold-and-mildew-eliminating spray to clean tub mats. 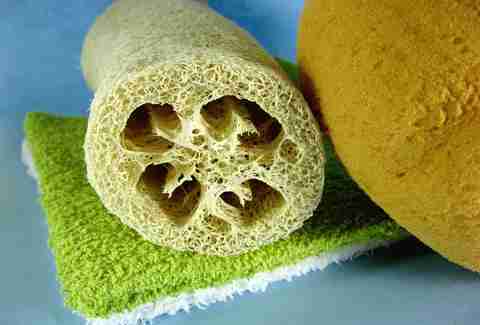 Allow the cleaner to work for about 15 minutes before scrubbing with a sponge and rinsing with very hot water. Here's a horrifying thought for you: bacterial growths like mold need two things to survive. Those things are food and water. They also love dark, warm places. That means your shower is like a luxury resort for mold, and that the plastic puffer that you use to scrub your body is especially attractive. Why? Because your skin, as well as products like soap and body wash, serve as food for mold. That means, in turn, that every time you wash yourself with that puff, you're scrubbing your skin with mold. Lovely thought, isn't it!? Clean it up: Wet the puff and microwave it for 30-60 seconds. Yes, microwave it! The exact same thing applies to that loofah that's hanging out in your shower caddy -- it's almost certainly harboring a ton of bacteria. Make sure to clean your body-scrubbing tools at least once a month to keep cooties at bay. Clean it up: Use the microwave method, or throw the loofah into the washing machine with a load of laundry, or run it through the dishwasher. 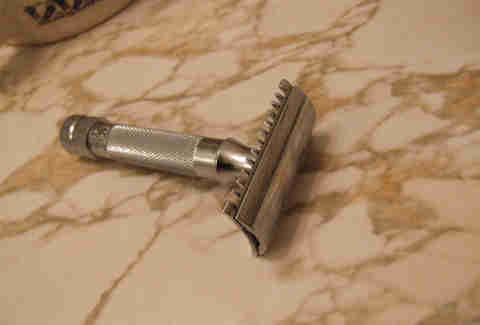 If you store a razor in the shower, it is very definitely disgusting. Not only will the buildup of shaving product and water residue lead to the development of bacteria, stray hairs will accumulate over time, leaving you with clumps of slimy hair embedded in the razor. Rinsing very well after use will help. Clean it up: From time to time, it's not a bad idea to soak the razor in a half cup of white vinegar, which has disinfecting properties, to give it a good cleaning. Then, rinse well in hot water and gently, but firmly, knock the razor on the side of a trashcan to loosen and discard any whisker clumps. 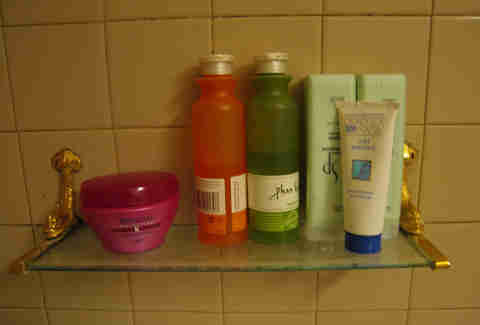 Even plastic shampoo bottles will develop bacterial growth after extended exposure to the damp environs of your shower. To make matters even more fun, do you know that shampoo can expire? It can! After two years, you'll want to think about tossing that bottle of shampoo, which will lose its effectiveness over time. Clean it up: If a bottle of shampoo has gotten a little ganky but is otherwise still good, wipe the exterior of the bottle, paying particular attention to the cap and underside, with a rag dampened with a small amount of white vinegar. 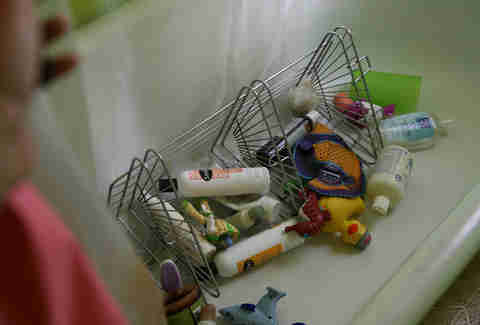 Most of us don't spend a lot of time gazing into our shower caddies, and that's probably for the best. They're seriously disgusting. Product buildup combined with pooled-up water makes for a nasty space in which to store your face wash. From time to time, it's a really good idea to remove them so that you can scrub the space where they meet the shower walls or tub edges. Clean it up: Metal or plastic shower caddies can be washed by hand with hot soapy water, just like you'd wash a dish, or they can go right in the dishwasher. Jolie Kerr is a cleaning expert and advice columnist. Her shower is exceedingly clean. Follow her on Twitter: @joliekerr.